Phil Shields rides a saddle bronc during the MSU college rodeo recently. Phil Shields will compete in the CNFR in June. Phil Shields poses with a championship saddle he earned. Even if you don’t know rodeo, tales of tough cowboys are hard to resist. They remind me of simpler times when rubbing a little dirt on it was considered sage medical advice. Shields is not your garden-variety gaucho. Two weeks ago the friendly fella from Philipsburg collected three championship saddles as the Big Sky Region’s ultimate hombre. 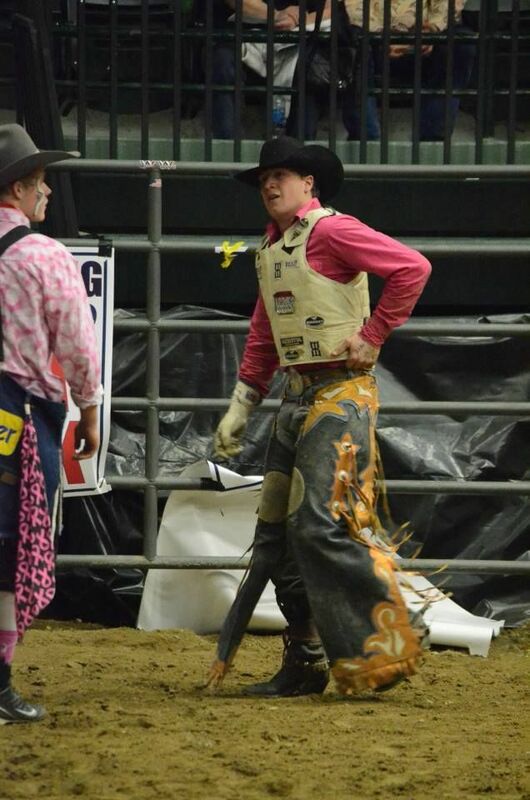 He won the bull riding, bronc riding and all-around points competitions. Next up is the College National Finals Rodeo (CNFR) on June 14-20 in Casper, Wyoming. Shields wants one of those shiny national championship buckles. You’d think maybe mastering one rough stock event would help a cowboy in another. If only it were that easy. “Bulls are a lot more agile,” Shields mused. “They can move more quickly. Shields would love to follow in the footsteps of his mentor, Jake Hayworth of Rexburg, Idaho. Hayworth won a regional all-around title for Montana Western and went on to win a CNFR buckle in bronc riding. “To be categorized with him would be pretty special,” Phil said. One aspect of rodeo most folks don't understand is that a lot of cowboys train to gain a competitive edge. When he is not attending classes or practicing, Shields lifts weights and works on his cardiovascular fitness. It's a little tougher fitting in workouts during the summer when you're competing in up to five rodeos a weekend. To counteract the sleep deprivation, Shields makes a concerted effort to watch his diet. The business administration major just finished up his junior year and it won't be long before he's out in the real world. For him the ultimate dream would be making a living on the pro rodeo circuit. "I'm going to focus on my bronc riding and go hard in the pros and see if I can’t keep on having some success there," said Phil, who makes a point to compete in the Missoula Stampede each August. "For me it’s all about maintaining your cool and doing what you know how to do and having fun while you’re doing it." Shields swears he doesn't get scared. Mad as heck maybe sometimes, but not scared. "What I absolutely disliked was separating my shoulder and being forced to sit out the whole summer after my freshman year," he offered. "I ended up having to sit out nationals. "I had a little chip on my shoulder and I've used it," added the Big Sky Region's two-time defending points champion in bull riding. "You never know when injuries are going to happen. I just made sure everyone knew I was going to be coming with my hammer cocked." When he's not busy with school or rough stock riding, Shields loves to help his father on The Ranch at Rock Creek near Philipsburg. You might say he's old-school Montana to the bone and easily one of the best rodeo cowboys to come out of these parts in a while.